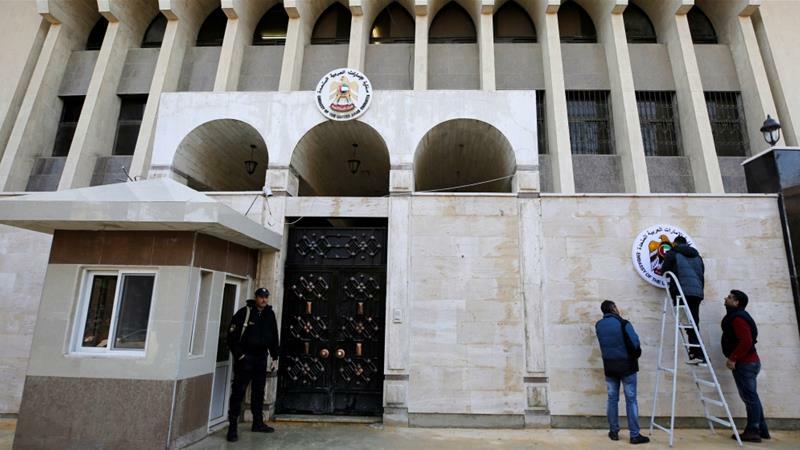 The United Arab Emirates government has reopened its embassy in the Syrian capital, Damascus. The re-opening is said to be a diplomatic boost for President Bashar al-Assad from a regional adversary that once backed rebels fighting against his forces. The UAE recalled its ambassador from Syria after the start of a popular uprising against President Bashar al-Assad in 2011, which escalated into a brutal and multifaceted war that killed hundreds of thousands of people, forced millions from their homes and destroyed the country's infrastructure. Nearly seven years later, and with government forces having regained control of the majority of Syria, the UAE flag was raised again at the building in the Abu Rummaneh district of central Damascus during a ceremony on Thursday attended by diplomats and journalists. An acting charge d'affaires has already started working, an Emirati statement said. The UAE said the reopening was intended to normalise relations with Syria and curb the risk of regional interference in "Arab, Syrian affairs." UAE's Foreign Minister Anwar Gargash twitted saying The UAE decision ... came after a conviction that the next stage requires the Arab presence and communication in the Syrian file," Anwar Gargash, the UAE minister of state for foreign affairs, wrote on Twitter. The UAE's move, which follows a visit to Damascus by Sudanese President Omar al-Bashir earlier in December, is seen as another step in efforts by Arab countries to bring the Assad government back into the fold after years of diplomatic isolation. Rumours of the Emirati embassy reopening had circulated in recent days as renovation work was seen at the building. Previously, the UAE was one of several regional powers that backed opposition fighters in Syria, though its role was reportedly less prominent than those of Saudi Arabia, Qatar or Turkey. Assad's forces, meanwhile, have been supported by Russia, Iran and the Lebanese group Hezbollah, among others. Military advances gathered pace this year following the defeat of the last sizeable rebel enclaves near Damascus and the recovery of the southwestern region at the border with Jordan and the Israeli-occupied Golan Heights. Syria was expelled from the 22-member Arab League in 2011, and Arab countries have sanctioned Damascus and condemned its use of military force against the opposition. However, Thursday's event, along with al-Bashir's visit and the reopening of the border crossing between Syria and Jordan, have prompted speculation that relations between Syria and its US-allied, Arab regional neighbours may be beginning to thaw. The Arab League is set to meet in Tunisia in March, with member state Egypt calling for Syria to be reinstated and the secretary-general, veteran Egyptian diplomat Ahmed Aboul Gheit, saying in April that the decision to suspend Syria had been "hasty". "Recent discussions on this issue have not yielded a consensus," Hossam Zaki, the League's deputy secretary-general told reporters in Cairo on Monday.